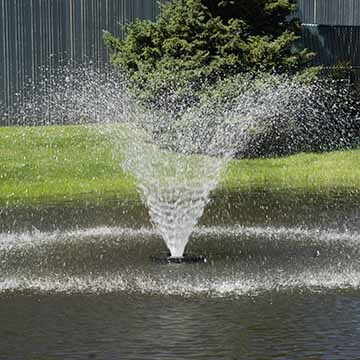 The Vitaflume® Floating Fountain is the perfect 1 HP fountain for small ponds. Matching beauty with function and price, the Vortex is the standard pattern for our aerating fountains. The Vitaflume® Floating Fountain is shipped to you direct from the manufacturer. It has a stainless steel pump housing filter and uses an impeller to project water at a high volume. 230 V, 60 Hz, 8.2 Amps: 7' HT. x 20' DIA. Call us Toll-Free at 1-877-428-8898 for more information. The Fountain has four main parts (float, suction screen, throat and motor). The high quality stainless steel motor and fasteners that are used in our floating fountains will give many years of reliable service. 8.2 amps; 230 V, 60 Hz. LED Light Set: Three LED lights each providing 9 watts of white light. Manufactured by Lake Restoration, Inc.
International shipping available. Please contact us 1-877-428-8898 if you live outside of the United States or Canada.